The recipes by Minimalist Baker are my entertaining secret weapon. In order to perform due diligence to the “minimalist” moniker, there are strict parameters: all recipes must require 10 ingredients or less, one bowl or pot, or 30 minutes or less to prepare. When cooking for a crowd, this simplistic approach is critical for a smooth dinner party/my sanity. But here’s the thing about Minimalist Baker author Dana. 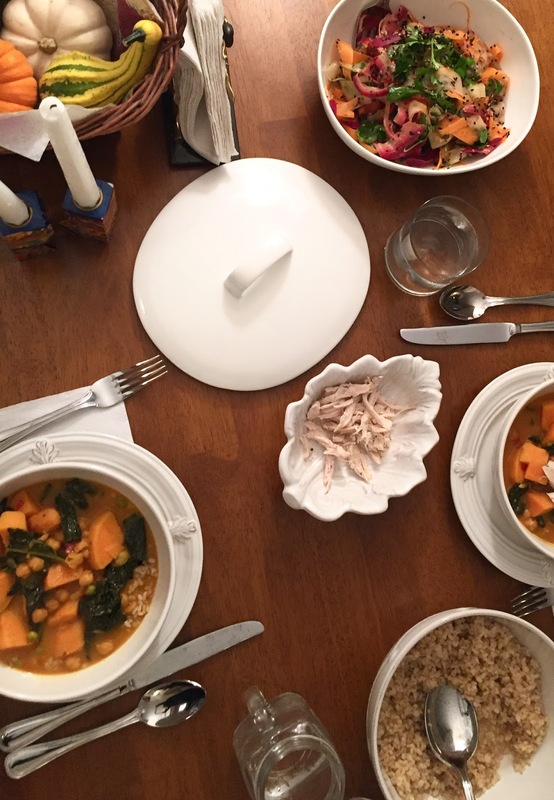 Not only are her recipes easy, they are unequivocally fantastic. Each recipe erupts with bright flavors, intelligent combinations, and crowd-pleasing triumph. Translation: I feel comfortable trying a novel recipe on a group I am eager to impress. 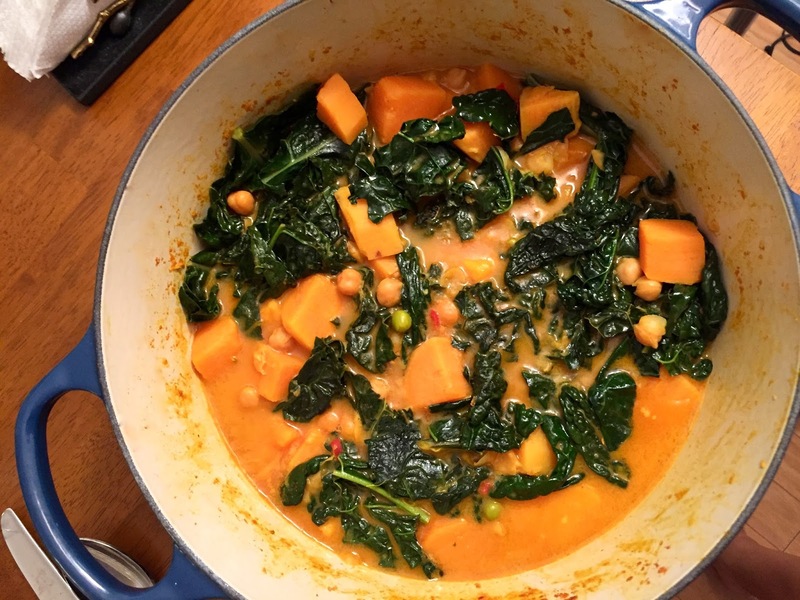 Case in point: One-Pot Kale and Sweet Potato Curry. Curries are known for their intense spice, and there’s no shortage of apropos savory here. Ginger, chili, and turmeric accompany Thai red curry paste (if you are a soup enthusiast, make this a pantry staple for the colder months) in a silky broth of light coconut milk and dash of maple syrup. The broth bellows cozy! hearty! filling! But keeps other descriptors like “heavy” “rich” “where’s the Tums” at bay. All the positives of ebullient flavor without the stomachache of a fat-laden soup is difficult to achieve in a robust curry. But here lies the genius of Dana’s recipes. The broth lends itself to a host of vegetable combinations; any leafy green, potato, or squash will do. 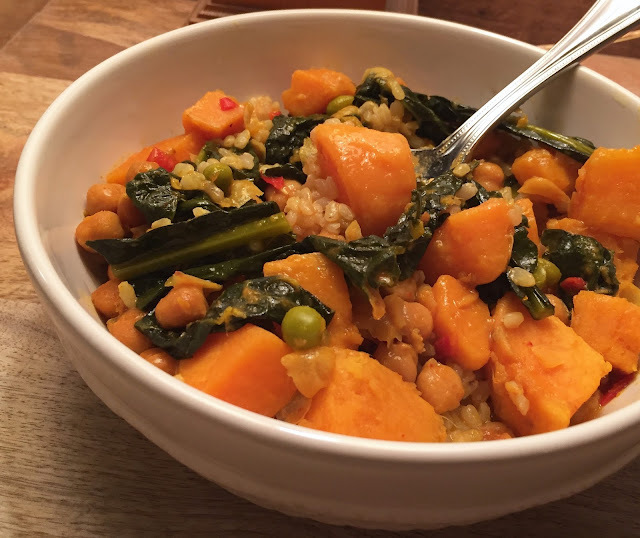 But I immensely enjoyed the juxtaposition—both flavor and texture— of the earthy, ribbed Tuscan kale against the soft sweet potatoes, dotted with peas. 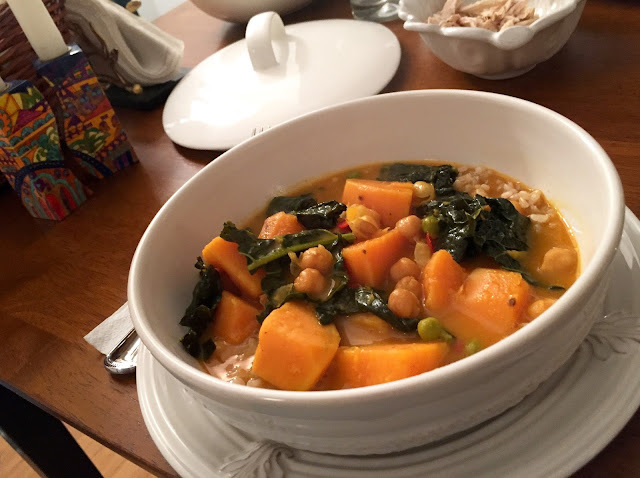 I did make a few small tweaks, reflected in the recipe below: I doubled the servings of vegetables, and added chickpeas for a protein boost. Because the curry is so flavor forward, I recommend serving over a bed of plain brown rice to balance the meal. Arranged on the side, cilantro sprigs and lemon wedges make beautiful and customizable accoutrements. 1. Heat a large pot over medium heat. Once hot, add coconut oil, shallot, ginger, garlic, and pepper. Sauté for 2-3 minutes, stirring frequently. 2. Add red curry paste and sweet potato and stir, and cook for 2 minutes more. 3. Add coconut milk, maple syrup, turmeric, and a pinch of salt and stir. Bring to a simmer over medium heat. 4. Once simmering, add peas and slightly reduce heat. You want a simmer, not a boil, which should be around low to medium-low heat. 5. Cook for 5-10 minutes, stirring occasionally, to soften the potato and peas, and infuse them with curry flavor. Taste and adjust flavor as needed. 6. Once the broth is well seasoned and the potatoes are softened, add kale, chickpeas, cashews (optional) and lemon juice, and cover. Simmer for 3-4 minutes more over low to medium-low heat. 7. Serve over rice, accompanied by lemon wedges and stalks of Thai basil or cilantro.